As you might know, I like to keep an eye on my Feedburner / RSS / Aotm / feeds stats. Neville Hobson has just shared some of his Feedburner stat data and I thought it was interesting how similar some of the trends are compared to mine. Some differences too. 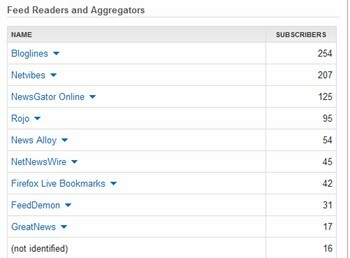 Around 47% of Neville's subscribers are using Bloglines (consistently) and NewsGator at #2 (14%) , while for me only 22% of my subscribers use Bloglines (that is big drop since Jan 06, see below) and Netvibes is number #2 (at 18%). For my subscribers, Netvibes is really a new entrant - it didn't feature in the previous update I gave. FeedDemon is still there, but not where it used to be for my FB subscribers (I wonder if some FeedDemon users are counted as NewsGator now?...Nick?). Another difference between Neville's stats and mine in the intial take up of the feed. His has quite a sharp take-up in the first few days, while mine (see below) is much more gradual. I think this is to do with the fact that I haven't been able to include an automatic redirect (where as I think Neville could, am guessing though). I still can't shut down my other feed or do the redirect, but the proportions are looking a little better now since my plea - I think around 65% of my readers are now sub'd to the FB feed. This tallies with the 'Share Your OPML' data, which counts my two seperate feeds er, seperately (67 on the old feed, 97 on FB feed, which if counted as one would put me in the top 100, but whatever). But Bloglines is the big dropper for me. It was a 31% in January, now at 22%. I haven't seen any aggregate data reports from Feedburner, and would like to compare on trends. That is interesting, Alex, to see those differences in subscriptions. My lot are mostly still a Bloglines crowd. None with Netvibes yet. Another dynamic here, too, I think – the different types of people who subscribe to different blogs. Plus geography may be a differentiator, too: I’m in Europe, you’re in the US (although hard to see what that differentiator actually could be). Maybe Rick can throw some light. Yes, synchronized feeds are counted as NewsGator rather than FeedDemon. Firefox is generally more popular in Europe than in North America, and in non-English feeds, Netvibes is gaining popularity at a staggering pace (especially in Europe). Type of content, as well as geography do play a huge part in the breakdowns we generally see. Tech bloggers who have been at it for a long time still carry a lot of Bloglines subscribers, other more commercial publications tend to have a lot more subscribers driven from the portals, as one might expect. Feeds that are a mix of text and podcasts see a much different breakdown as well. I find that Bloglines is down more than it is up. One interesting thing is that often it is fine from a US originated IP but not accessible when I use a UK/Europe location. never heard about netvibes… just took a look at the page, and it looks very similar to my windows live page (live.com). does feedburner also show if someone consumes rss via windows live page? in addition, what is your opinion about the functionality of the customized live.com page? do you use it? To David: IRT "I find that Bloglines is down more than it is up. ", I live in BlogLines, it was down for me on one occasion several months ago, that’s it. I’m in SC, USA.